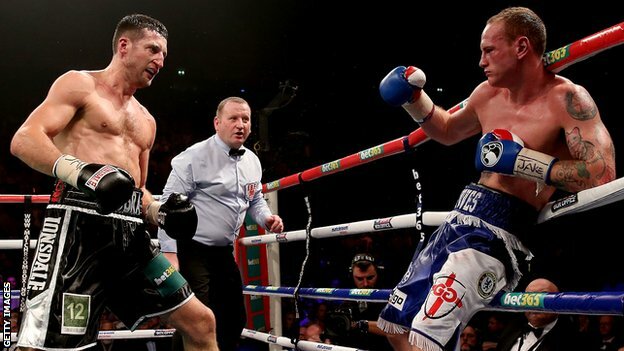 Carl Froch believes referee Howard Foster saved George Groves' career when he controversially stopped their WBA and IBF super-middleweight title fight. Froch retained both belts at the Manchester Arena after Foster stepped in to end the bout in round nine. "Howard Foster did a fantastic job in stopping it and saving his career," Froch told BBC Radio 5 live, adding he would be happy to offer a rematch. But Londoner Groves, 25, complained Foster had "made a terrible decision". He tweeted: "Truly gutted. I played my part and from what I've seen of the footage the ref made a terrible decision. I will demand my rematch." The challenger knocked down his opponent in the opening round, and led on all three judges' scorecards going into the ninth, but Foster stepped in as Froch rained in a series of unanswered punches. Speaking to BBC Radio 5 live's Sportsweek programme on Sunday, Froch said: "There'll always be controversy with fights that are stopped when they are swinging one way and then swinging the other way. "The referee has a split-second decision and it can be difference between somebody being seriously injured and somebody then going on to have a fantastic future. Howard Foster did a fantastic job." 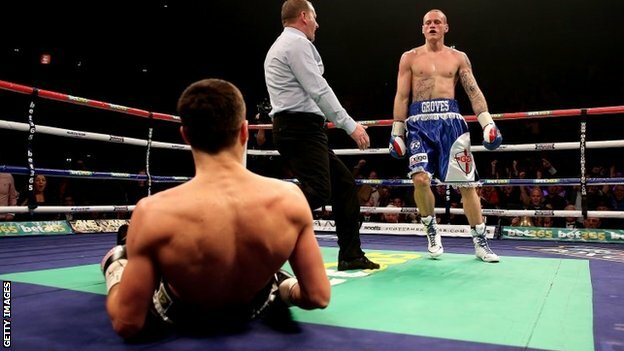 Froch, 36, argued that Foster had to stop the fight as Groves, who suffered the first defeat of his 20-fight professional career, was unsteady after receiving a thunderous right hand - and had turned away from the defending champion. He said: "I've watched it back. I landed a big right hand and I think I landed another right hand. "George Groves turned his back on me and was slumping down to the floor, his arms were collapsed and his head was hanging and he wasn't defending himself. "So I don't think the referee had any choice but to stop the fight. Now if the referee did not jump in, who would be to blame?" Froch (32-2) will discuss the possibility of a rematch with his promoter Eddie Hearn and trainer Rob McCracken. He added: "If it makes sense and Eddie Hearn agrees with it and my trainer Rob McCracken agrees with it, of course I will give George Groves a rematch and of course he deserves it." Groves, though, insisted he would have been able to continue. "He caught me with a good shot but that should never have been a stoppage," he said. "Because he's got this warrior image, he got the benefit of the doubt. Because I've got this chinny image, it was stopped prematurely, in my opinion. "I'll come back better and stronger and I hope I get that chance." Froch was allowed to continue after being knocked down by Groves in the first round, but the Nottingham fighter insisted he had made clear to the referee that he was able to carry on. He said: "I definitely had a moment where I was out of it a bit. I got caught with a right hand and I was put on the seat of my pants. "That sometimes happens in boxing - it's happened to me twice now in my whole career - it was a fantastic shot by George Groves. "A lot of fighters wouldn't have got up from that but me being me, I got up and carried on fighting. "I got myself back on my feet. I looked at the referee, I was composed, I walked towards him. I did everything you do, showed the signs to say: 'I want to carry on fighting, I am OK.'"